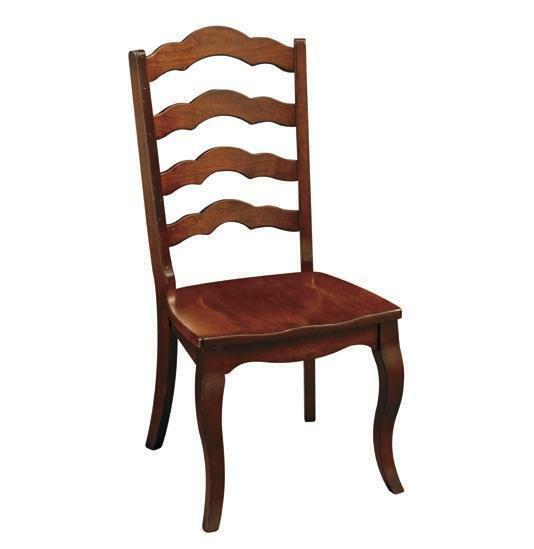 This elegant dining room chair is simply beautiful. The Avignon Dining Chair features strong elements of the French Country Style, including an elegant, yet refined, handcrafted ladder-back design. While traditional ladder-backs tend to be classified as French Country, the Avignon ladder-back dining room chair features crowned ladder steps (similar to the molding found in many Queen Anne style pieces) and lacks stretchers between legs. This unique blend of styles becomes a style in of itself. Our master Amish craftsmen never cease to amaze us with new, practical and beautiful designs! The Avignon Dining Chair is another welcomed Amish made treasure! The Avignon Dining Chair is available in a number of stunning, North American solid hardwoods! Additionally, you can choose to have added arms, hand planed seat, a fabric covered seat, or a leather seat! Please call with any questions, for assistance customizing, or for assistance beginning your order. Our on-call furniture specialist will gladly work with you to create the perfect dining room set for your home! Toll-free: 1-866-272-6773.